In some previous blogs, I talk about being inundated with butterfly imagery last year, and the feeling of being in a cocoon the last few months. This past week I have felt like I am starting to emerge. 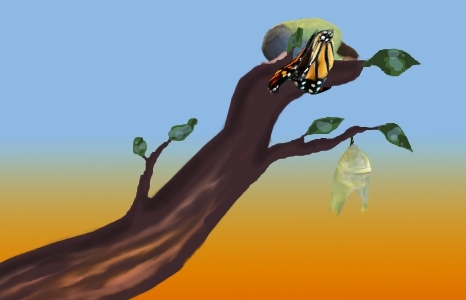 Part of being in a cocoon is being dormant, not passionate, wrapped up in myself and my own experiences. I felt a bit of depression as well. Not that I was completely shut off from other people and not that I was completely heartless (the cocoon was not completely opaque). I was faced with some gut-wrenching choices that grew from the soil and muck of feeling overworked and the extreme opposite of being appreciated, and a lack of respect by superiors at work. In the other arenas of my life- friends and family- I am well supported by wonderful people, and I am very grateful for that. The ordeal at work tore open old wounds, and I was back to re-developing a love of myself and who I am. I am still in the midst of re-developing it- I’m not completely free of that yet. Ironically, though I experienced some added ordeals this past week, I feel refreshed as a person. I feel like I am breaking out of the cocoon. The skin of the cocoon has thinned and I can wrench my head and upper limbs free, and see and love the outer world. I’m not sure what it is that did it, or if it was “just time.” It may be that a recent meeting with superiors brought many things even closer to my inspection and I faced reality even more head-on. Although I had decided months ago that I would resign from my current position, I hesitated to do so. I still haven’t done it, though I drafted a resignation letter last week. I plan to 1) figure out the correct steps to do it and 2) follow those steps in turning it in next week. It feels a little like the Fool’s card of the tarot deck: stepping gleefully over the brink of a cliff and into the unknown. Though this act of resignation doesn’t feel gleeful- instead, it feels …. resolute, freeing, a little gut-wrenching in the final goodbye of my current position, and final. I’m not sure if it’s the decision to finally follow through with what I’ve known I need to do for months that is making me feel fantastic, or if it’s that I’m back in control of my life. It’s ironic, because with this step, I also lose control- I won’t be employed, at least (hopefully) for a short time. That’s the scary part. Why, in this economy, would I do such a thing? I will be doing it because I must. If I don’t, I feel that I will be failing myself, letting myself stay down the well with steep sides (and jeering hands like in the movie Labyrinth) and leaving myself in a place where I feel worthless. I want to be clear for any critical and caring thinkers out there that I am applying for jobs as well as working on getting certification as an interpreter, which will likely open up more jobs for me, once I get that certification. It seems that it will take me a year or less of passing exams and honing my skills to get to where I want to be in that field. I hope that my perception of that is true! I also have money saved, that I can use toward schooling if that is needed and to live on. It isn’t always so horrible at work that I feel like I’m in the well- sometimes I’m at the top of the well looking out, and sometimes I’m deeper down; but it often feels deeper down. My boyfriend, who I started dating 3 years ago, says I even felt it then, and that I would be oftentimes extremely stressed. That’s one wondrous thing about my boyfriend: he is a gentle reality checker for me. A gentle person holding up a mirror, ready to hug me and support when I react to what I see. It’s one of the reasons I love him. The feeling of emergence is fantastic. I say ’emergence’ instead of fully being a butterfly, because I don’t want to assume I’m completely finished ‘baking’ yet, and because I have no idea what’s to come. Maybe the feeling really is more like I’m ready to stretch my wings; I’ve come out of the cocoon and my wings are still wet, so I can’t really fly yet. I feel friendly, open, passionate, and happy to be alive, and at the same time quite grounded. I hope this state of being continues. I am looking forward to flying, and yet am happy to be at the stage I am in. Update: On further reflection, I will 1) talk with my union rep 2) talk with powers that be in HR and 3) make a decision on next steps. I may be ‘throwing away’ certain opportunities if I resign. We shall see. Geeking out on – of all things – Organizing! This post is going to be a bit mundane. It has nothing, or probably nearly nothing, to do with anything pagan. It’s just something about my daily life. Unless it can be said that pagans are messy, but that would be stereotyping ourselves, I’m sure! I know plenty of very clean and neat pagans… I’m not one of them! For about a half a year, and especially the last month or so, I’ve been focused on organizing and getting rid of things. As I may have already said, I’m a Cancerian- a ‘double’ Cancerian with my moon and sun in Cancer. A typical trait of Cancerians is that we hoard. Uh yeah, erm, understatement. I hoard things. I’m getting rid of things I’ve had since college. That would be 15 years ago. I have a “give-away” pile going just past my entryway- out of the walking path, pushed to the side. Those who have worked with me will confess with long-suffering smiles that I am *Messy*. My teacher desk is clean, for maybe the first week of school. Maybe. Then it has piles on it until, well, the end of school. It may be a sad statement to make that I am finally at the point where I don’t have so many things needing done ‘yesterday’ at work that I can finally organize things to make my work easier. If that had been done in the beginning of the year, well, that would have been logical, wouldn’t it. Regardless of how late in the year it is and how “ironical” it is, it does feel good to get organized. It’s been a gradual process in my life. I have some OCD people to thank for that. No, seriously. 🙂 One of my best friends is OCD. She not just jokingly is, and she’s a wonderful person. Her purse has little bags in it to organize all her stuff. It would seem like this is common sense, and maybe it is common sense for most people, but this was a HUGE thing for me to realize: a purse can be organized! Since then I have little bags in my purse, too! I do still need to clean it out from time to time, but I have a special spot for each thing. The ‘special spots’ have been developed especially in the last month. For example, I didn’t have a place just for my gum/menthos/etc. Now I do! For some reason that makes me proud! 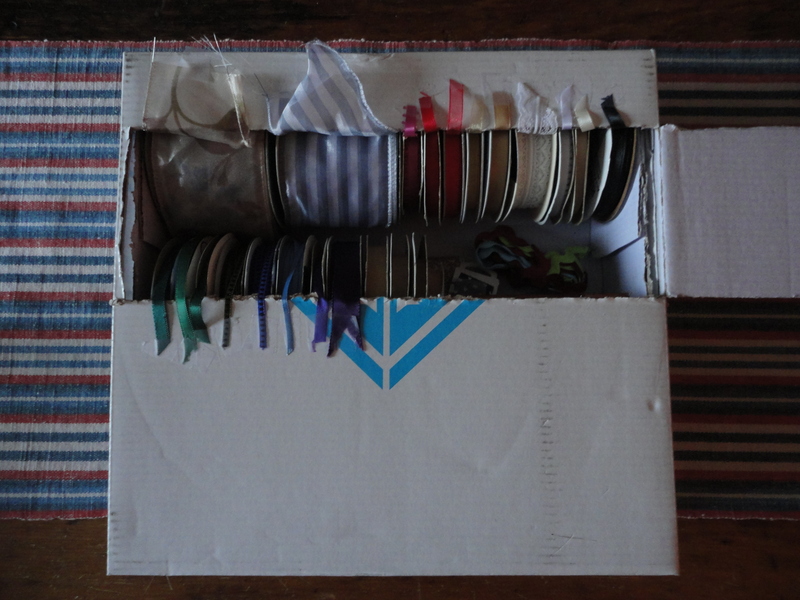 –my ribbon– in a special box with holes in it to let the ribbon out, with dowels to put the ‘wheels’ of ribbon on. I am a little embarrassed to say that it was a Martha Stewart idea. I have been a scoffer when it comes to her kind of ideas, they are a little too ‘posh’ and uppity for me, but maybe that’s my own little weirdness. Maybe it’s that I’m turning into Martha Stewart as I age, and the little teenager in me wants to still be a headbanger! I cut the box shorter so it would fit in a drawer. 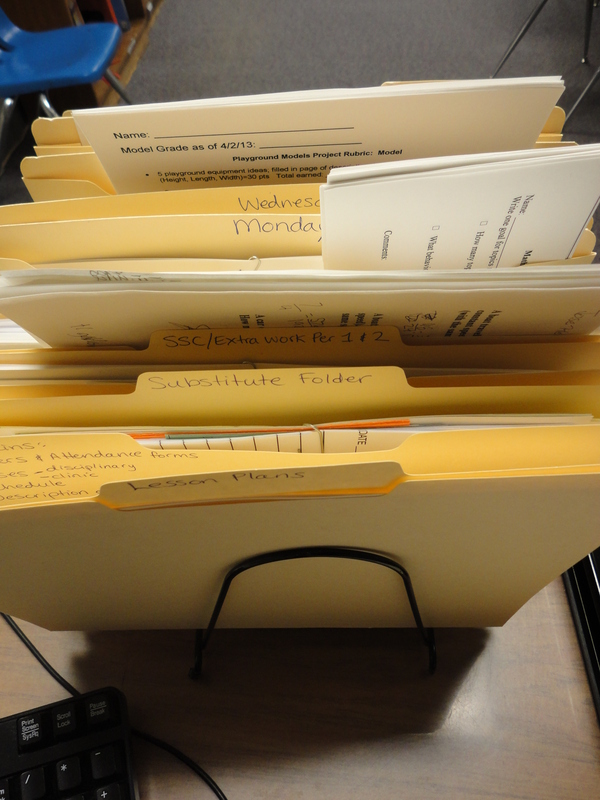 -as of today: files for the days of the week and Math folders in my classroom for the students to put away work. In my own defense, before I moved classrooms, I did have a days of the week file thingy for my desk. I now have one again and WOW it feels awesome to put papers in there!! Not just from a paper-nerd standpoint, but it’s a relief to put it in a place I’ll easily find it for when I need it! I know, go figure, huh! The one on the right is the Math folder organizer for students. It doesn’t have a label yet… baby steps. 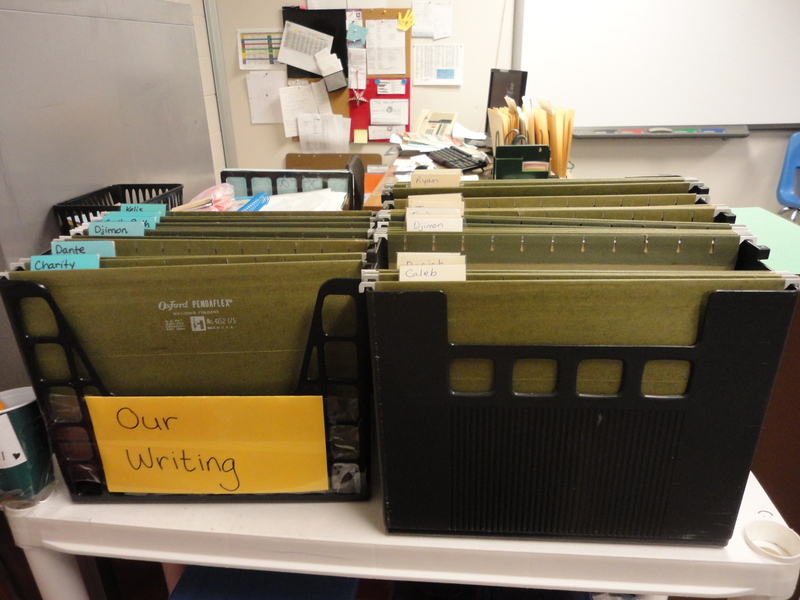 Folder organizer on teacher desk- has a lesson plan folder, discipline slips, passes, sub folder, Mon-Fri folders, and folders specifically for classes. -some fabric. Not all- I do have a whole bunch occupying seats around my table waiting to be made into something. But the rest *is* in fact, believe it or not, organized in my craft room! I even have organized socks to be used as material in projects. I’m not really into fake flowers, but I had a lot left over from crafting- I saved these and gave the rest away. Organized by color. 🙂 I made the top shelves out of packing material that cushioned electronic devices. I taped everything down with packaging tape, because it drives me nuts when things swish around in there and it gets all messed up. 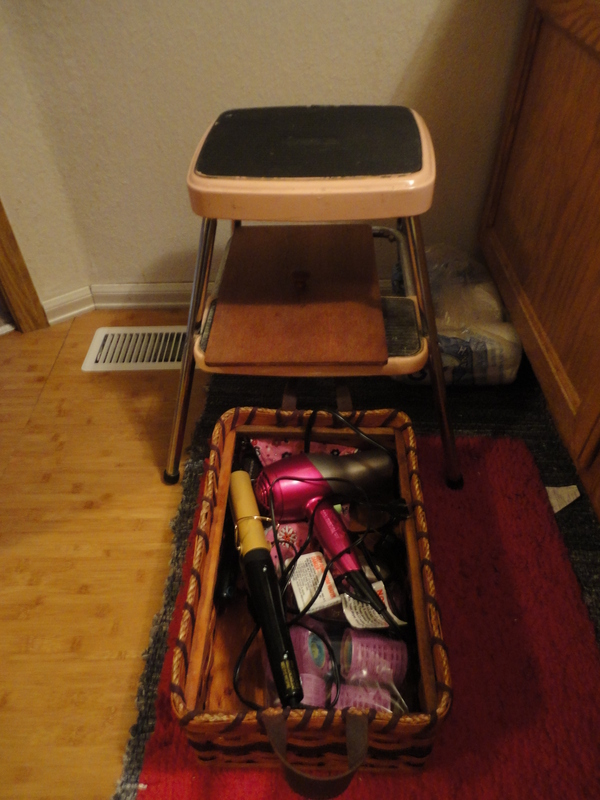 -my curlers and curling iron and blow dryer and blowdrying hairbrushes are all in the same bin now. It used to be a bread box but they all fit in there, and they tuck away under a kindof antique stool that works as a small table in my bathroom. 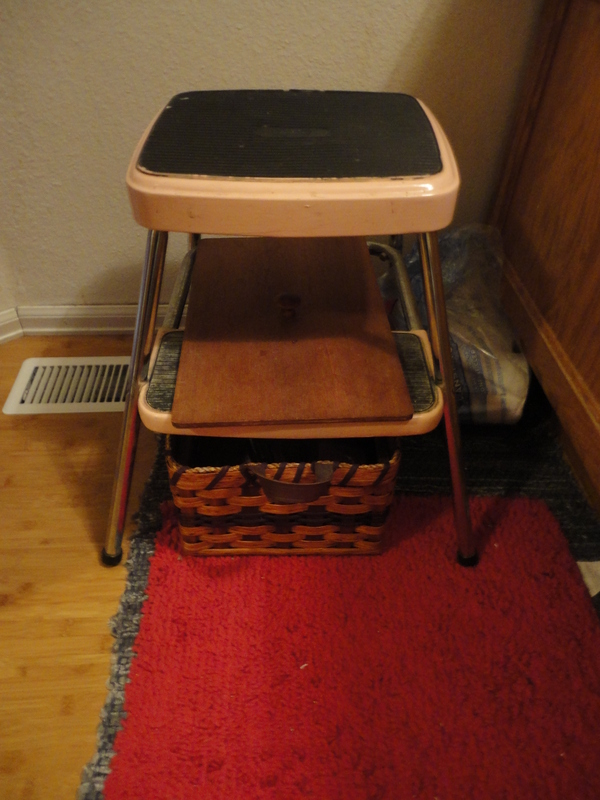 Someday I want to paint the stool. It’s a kindof cool retro color, but it’s too “Mary Kay” for me. I was thinking some kind of purply light blue. Also the black rubber has spots- I want to clean that and make it look sharp. 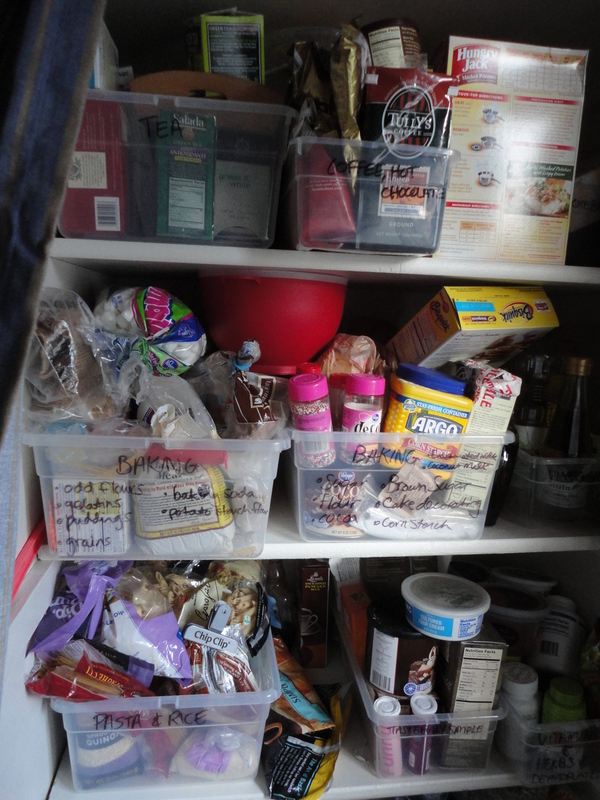 -my pantry: it was a mess until one or two years ago. I bought a WHOLE bunch of clear plastic rectangular shaped bins, and organized and labeled ALL of it. I do need to go through it and throw out old stuff (like boxes with 1 cookie left in them), but it is _really_ organized now. 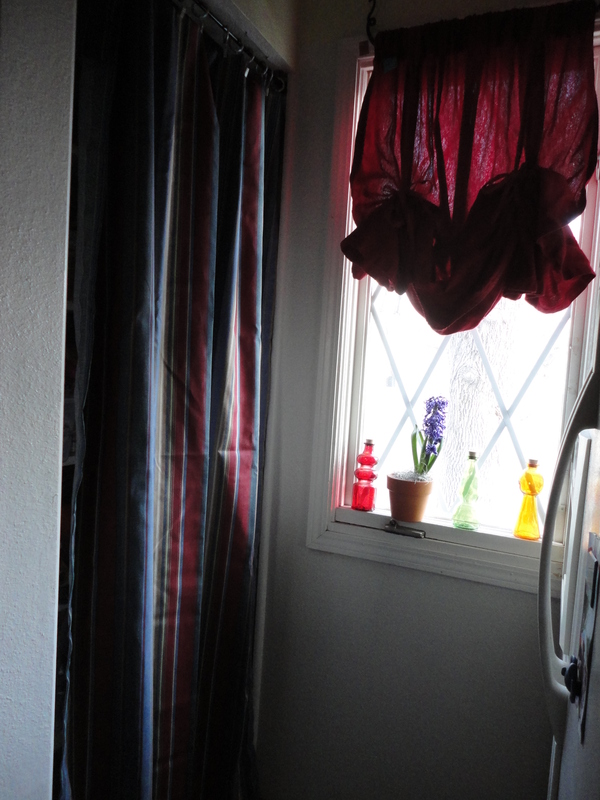 I recently put in the curtain. It used to have a trashed plastic accordion door. 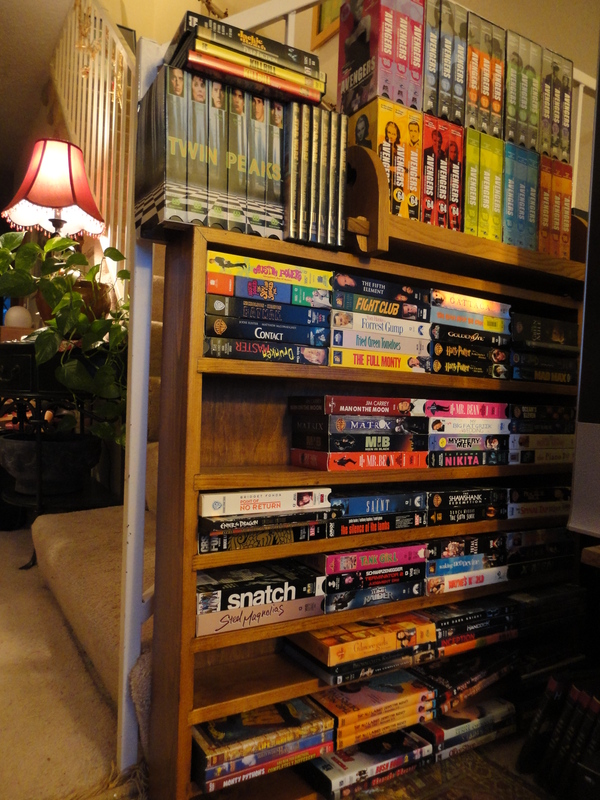 I left spaces on the shelves just in case I add one, so I don’t have to shuffle everything to keep it alphabetized. Now, don’t be fooled- I still have various piles of things, either waiting to be organized, or waiting to be made into something, or… just waiting. Lonely little piles, just waiting for someone to love them. ::sniff::!! All of this to say, that I’m not sure where this trend is coming from, but I do like it! And I hope it continues!